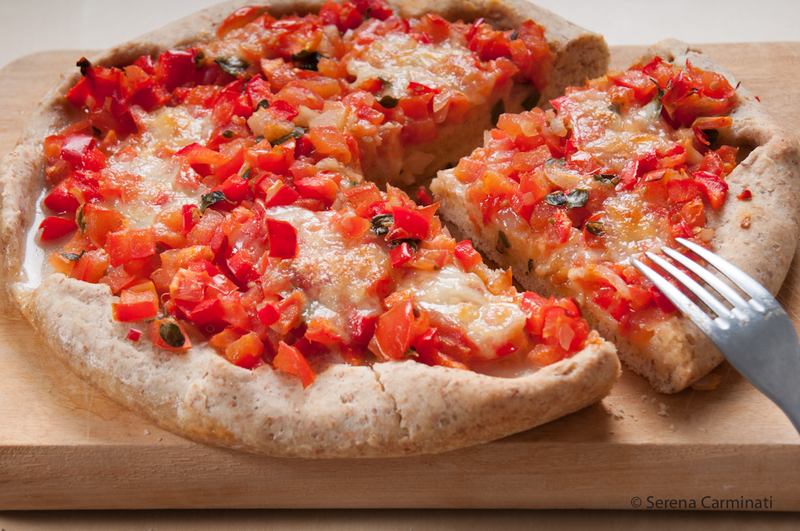 Plain but full of flavour, Pizza Margherita is one of the most appreciated pizzas in Italy! We use only fresh and the best quality ingredients, in order to get the right combination of flavours. It’s so simple but really delicious! I often prepare this pizza with a sourdough starter and make a dough using mainly spelt flour, because I love it’s nutty flavour and crunchy texture. Here is my favourite sourdough recipe for the pizza base and the normal yeast version. 1. Preheat the oven at the highest temperature and with the fan running (to dry out the excess water from the cheese). Place the pizza stone in the oven (the pizza stone has to heat up gradually, because otherwise it will break). 2. Once the pizza stone is hot, remove it from the oven and dust with some dried (quick cooking) polenta (the polenta will make the pizza crust crunchier). 3. Roll out the pizza dough on the stone, top with the ingredients and place to cook in the oven, with the fan running, for 30-40 minutes (depending on the temperature you are using). 1. 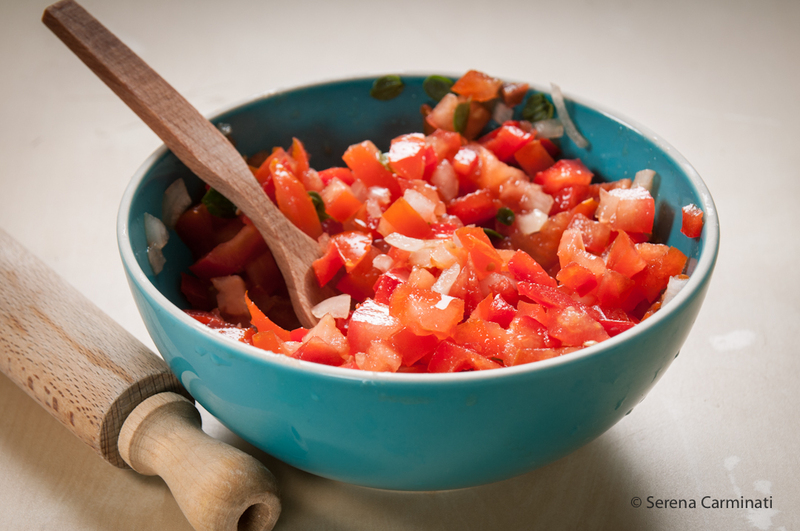 Use the best quality tomato sauce you can get ; if the tomato sauce is too acidic, you can add some sugar and make it sweeter. 2. Mozzarella is usually preserved in water, so you have to rinse it really well and squeeze it with your hands when you use it. 3. You can use different herbs to personalise your pizza; we often use oregano, basil or marjoram. An easy recipe, perfect for this season! Pizza with tomatoes, rocket and Parmesan cheese. 1. Wash and dry the rocket leaves and the tomatoes. Cut the tomatoes in half. 2. Using a rolling pin, roll out the pizza dough and make two large pizza bases. 3. Bake the pizza bases at 200 ° C (392°F) until they are crunchy (I am using a use a pizza stone, but you can use a baking tray greased with olive oil). 4. Add the mozzarella cheese and put the bases back in oven for a few minutes, to melt the cheese. 5. Turn off the oven and garnish your pizzas. Place the tomatoes, the rocket leaves and Parmesan cheese onto the pizza bases, then season with extra virgin olive oil, salt and pepper. Pizza con pomodorini freschi, rucola e parmigiano. 1. Lavate e asciugate la rucola e i pomodorini, poi tagliate i pomodorini a metà. 2. Stendete la pasta con un matterello. 3. Infornate le basi della pizza a 200° C (uso una pietra per la cottura della pizza, ma potete usare una teglia unta). Fate cuocere fino ad ottenere una pasta croccante. 4. Aggiungete la mozzarella e infornate ancora per qualche minuto, per far sciogliere il formaggio. 5. Sfornate le pizze e spegnete il forno. Disponete i pomodorini, la rucola e il parmigiano sulle pizze, poi condite con abbondante olio extra vergine d’oliva, sale e pepe. This focaccia al formaggio di Recco (Cheese Focaccia from Recco), is one of the most appreciated dishes we have in Liguria. Many bakeries and pizza places make this amazing focaccia, but only a few really excel in this recipe. This focaccia is basically made with two almost transparent sheets of pastry, made with flour, olive oil, salt and no yeast. The cheese is then arranged and sealed between the pastry layers. The result should’t be either too oily or dry, the pastry should be crunchy on top and the cheese should be very fresh and creamy in the middle. Sometimes I add milk to the cheese to make it a little extra creamy. But you really have to use only fresh crescenza or stracchino, because no other cheese will taste as good as these cheeses in this recipe! The preparation method will requires some care, especially when you roll out the dough to make it thin. Yes, to make a thin layer might be tricky the first few times, however after some practice it will get easier and the pastry thinner. 1. On a work surface or a table, place the flour, then add the salt, 2 tablespoons of extra virgin olive oil and enough water to make a soft and smooth dough. Knead well. 2. Dust the work surface with some flour and roll out the pastry using a rolling pin. Stretch the pastry further with your hands, until you get two almost see-through sheets (careful not to break them). 3. Place a sheet of pastry on a large baking tray, greased with extra virgin olive oil. Arrange the cheese (cut into pieces) on top of the pastry, then cover everything with the other sheet of pastry. 4. Seal the edges of the pastry together, so that the cheese will stay inside when it melts. 5. Slightly pierce the pastry (only pierce the top layer, not the base). Bake at 200 ° C (392° F) until the pastry is golden and crispy. Salt and serve straight away. 1. Su una spianatoia, disponete la farina a fontana e aggiungete il sale, 2 cucchiai d’olio e l’acqua necessaria per ottenere un impasto omogeneo. Impastate bene tutto. 2. Infarinate la spianatoia e stendete l’impasto con il matterello. Tendete ulteriormente l’impasto con le mani, per ottenere due sfoglie il più sottile possibile (senza romperle). 3. Stendete una sfoglia su una teglia grande, precedentemente unta con 2 cucchiai d’olio. Disponete il formaggio fresco (tagliato a pezzi) sulla sfoglia e ricoprite tutto con la seconda sfoglia. 4. Pressate insieme i bordi delle sfoglie, in modo da sigillare la pasta e non far uscire il formaggio. 5. Bucate leggermente la superficie della pasta, facendo attenzione a non bucare la base della focaccia. Infornate a 200°C, fino ad ottenere una focaccia croccante. Salate e servite subito. I already published a basic pizza dough recipe with normal yeast a few weeks ago, this is basically the same recipe adapted for sourdough. Before getting started with the recipe, let me say a few things about sourdough. 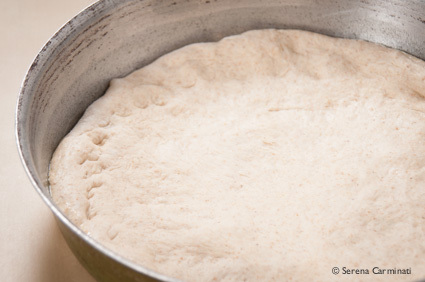 Sourdough is a natural yeast created by fermenting flour with water. It is a long process, which is not particularly complicated, but it takes some time and care. Basically, you create the natural yeast, then you feed it and keep it in good shape, that’s really all there is to it! In exchange, your sourdough will reward you with a lot of flavour, leavening strength and satisfaction! Moreover, sourdough is healthier and much more digestible than commonly used yeast. Another good reason to use it is the difference in taste, as sourdough’s flavour is much more delicate and pleasant than all the other yeasts. So, don’t give up if you haven’t tried yet, instead give it a go and you’ll see the difference, I promise you! To get started with sourdough you can follow the step by step recipe here. 1. The flour-sourdough ratio in recipes is usually 3 to 1 (3 parts of flour plus 1 part of sourdough). In order to prepare approximately 500 g of dough we will use 375 g of flour with 125 g of sourdough. You can use this recipe to make sourdough bread as well as pizza. 2. Semi-liquid sourdough contains a lot of water, therefore you have to add less water than in normal yeast pizza and bread recipes. My advice is to add a little bit of water gradually. 3. Sometimes it’s useful to make the dough in the evening and then keep it in the fridge with some extra water over night. The following day, take it out of the fridge two hours before you use it (knead the dough a little, then make the pizzas and let them rise for a couples of hours at room temperate). During this process the dough will rise much better and faster. 1. 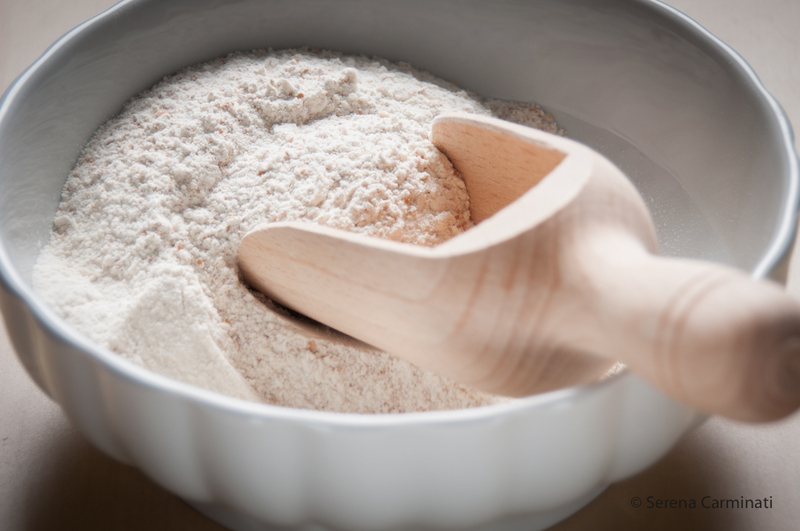 Sift and mix the flour on a wooden board or a large bowl (use a fine sieve). Mix the flour with the sourdough and a little bit of water. Add the salt and, if you want, you can also add 2 tablespoons of extra virgin olive oil with a pinch of malt. 2. knead vigorously, until you get an elastic dough. Let the dough rise in a sheltered place for 3-6 hours (the rising time varies depending on different factors, the dough is ready when it has doubled in volume). 4. Let the pizzas rise for about 1 hour, then bake in a preheated oven at 190° (374°F) for 20-30 minutes. Impasto base per la pizza con lievito madre. olio extra vergine d’olio d’oliva q. b. 1. Mescolate, setacciate le farine e sistematele a fontana su una spianatoia o mettetele in una ciotola grande. Unite il lievito madre alla farina con un po d’acqua. Mescolate leggermente, poi aggiungere il sale con cucchiai d’ olio extra vergine di oliva e un pizzico di malto, se desiderate aggiungerli. 2. Lavorate energicamente gli ingredienti, fino ad ottenere un impasto omogeneo ed elastico. Lasciate lievitare l’impasto in un luogo riparato per 3-6 ore (il tempo di lievitazione varia a seconda di diversi fattori, l’impasto è pronto quando sarà raddoppiato di volume). 3. Prendete due teglie grandi, ricopritele con carta da forno e spennellatele con abbondante olio extra vergine d’oliva. Stendete la pasta con un matterello e fate due basi per pizza, poi aggiungere gli altri ingredienti (in questo caso faremo una pizza bianca con crescenza e mozzarella). 4. Lasciate lievitare le pizze per circa 1 ora, poi fate cuocere a 190° C in forno preriscaldato per 20-30 minuti (dipende dallo spessore della pasta). Making your own pizza dough, for the first time, is probably one of the most satisfying things you can ever experience in your kitchen. There is something magical about the whole process, from the moment you first see the dough rising, up to the moment you actually see your beautiful creation coming out of the oven. I personally enjoy everything about this process and this is why I don’t buy it anymore. 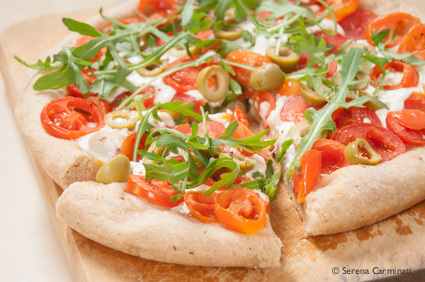 Moreover, once you start experimenting with different flours and ingredients, especially if you use natural yeast (but we will see this in part 2), home-made pizza can become a truly special dish to make. A few words on the preparation. To prepare (approximately) 500 g of dough for pizza or bread you must use 500 g of flour, 15 g of yeast, 10 g salt and some water. For this recipe I used different kinds of organic flour which have very different qualities from one another and help to create a certain harmony of flavours and textures. The amount of water in the dough and the leavening time may vary, depending on the ingredients used. This type of dough can be used, not only to make pizza but it’s also great to make focaccia and other breads. Notes. You can decide to add extra virgin olive oil and barley malt (or honey) to the recipe or not, depending on your personal taste. The extra virgin olive oil gives a crunchier crust and the malt (or honey) will help the leavening process, but both these ingredients will add some extra calories to your recipe, so if you are on a diet, don’t use them. I am giving you two options here, choose the dough with the ingredients that you prefer. 1. 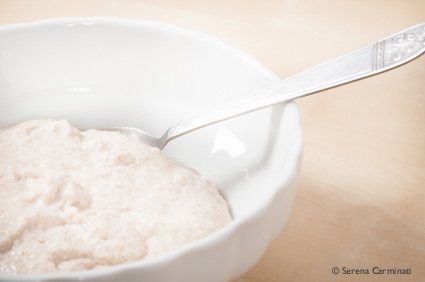 Break up the yeast into small pieces and mix it with a bit ‘of warm water and a few tablespoons of flour. Create a small dough and let it double in volume. 2. Sift the remaining flour with a fine sieve and make a well on a wooden board, then pour 200-250 ml warm water (gradually) and salt in the centre (also add 1 tablespoon of extra virgin olive oil and a pinch of malt, if you wish). Mix the ingredients. 3. Add the yeast dough (from step 1) to the mixture and knead vigorously. 4. Let it rise in a sheltered place until the dough has doubled volume (it might take between one or two hours). 5. Take two large oven trays, cover them with baking paper and brush the paper with plenty of extra virgin olive oil. 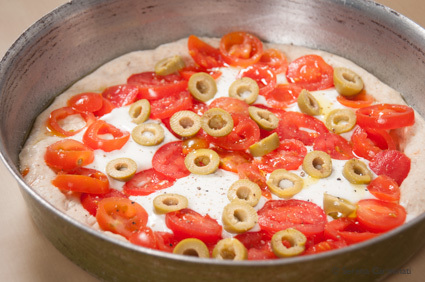 Roll out the dough with a rolling pin and then add the other ingredients (mozzarella, tomatoes, olives etc.). 6. Let it rise again for 30 minutes, then bake in preheated oven at 190 ° C (374° F) for 20-30 minutes. This pizza is called “Marinara” and is made with anchovies, tomatoes and crushed garlic. A very cheap and simple dish, but full of flavour! Impasto per la pizza (con lievito di birra). Per preparare 500 g di pasta per la pizza o da pane generalmente si utilizzano 500 g di farina, 15 g di lievito di birra, 10 g di sale e acqua. In questo caso utilizzerò farine biologiche di vario tipo, che presentano qualità molto diverse tra loro e che aiutano a creare una certa armonia di fragranza e croccantezza. La quantità d’ acqua necessaria da utilizzare potrebbe variare leggermente, a seconda delle farine e degli altri ingredienti utilizzati, così come il tempo di lievitazione. Questo tipo di impasto può esse utilizzato anche per preparare focacce e pane. Nota. Ho aggiunto l’ olio extravergine d’oliva e il malto d’orzo nella lista degli ingredienti, perché servono a creare una crosta più croccante e a far lievitare meglio l’impasto (nel caso del malto). Vi darò due ricette, così potete scegliere l’impasto con gli ingredienti che preferite. Metodo (per entrambi gli impasti). 1. Spezzate il lievito in piccoli pezzi e mischiatelo con un po’ d’ acqua tiepida e qualche cucchiaio di farina, fino a creare un panetto. Lasciate raddoppiare il panetto di volume. 2. Setacciate il resto della farina e disponetela a fontana su una spianatoia con 200-250 ml d’ acqua tiepida e il sale (aggiungete anche l’olio e il malto, se volgete utilizzarli). Mescolate leggermente. 3. Aggiungete il panetto di lievito e impastate tutto energicamente. 4. Lasciate lievitare in un luogo riparato, finché il volume dell’impasto sarà raddoppiato (una o due ore). 5. Utilizzate due teglie grandi, ricopritele con della carta da forno e spennellate con abbondante olio extra vergine d’oliva. Stendete l’impasto con un matterello, aggiungete gli altri ingredienti (mozzarella, pomodori, origano ecc.) e infornate a forno preriscaldato a 190° C per 20-30 minuti. As refreshing as a summer salad and as tasty as a pizza! This is why I decided to call this dish insalapizza (salad-pizza). I often end up with no mozzarella cheese in my fridge, and this usually happens when I feel like having a pizza!…So one evening I came up with this nice and simple recipe. Since then I have had several occasions to try out and improve this dish. I hope you like it! 1. Wash the seeds and soak them in water for 6-8 hours. 2. Mix the sourdough with the flours, some water and malt (or honey). Add the seeds and half a teaspoon of salt to the dough. Mix well and increase the amount of flour if necessary (the dough shouldn’t stick to your hands). 3. Let the dough rise until it has doubled in volume (3-6 hours, if you use sourdough). If you use normal yeast (not sourdough) you have to increase the amount of flour and water ( in this case, add 45 g of plain flour) to the dough. 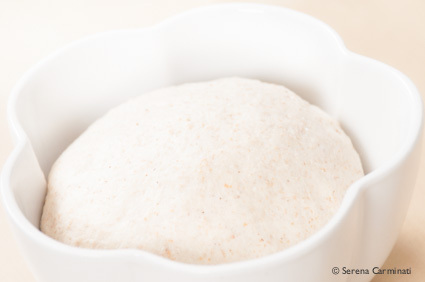 Dissolve the yeast in a little bit of water with 1 tablespoon of flour. Then add the yeast to the mixture and let it rise for about an hour. 4. When the dough is ready, roll out the pizza base in a round baking tray (20-30 cm in diameter), greased with plenty of olive oil. Let the pizza base rise for another hour. Meanwhile, clean and cut the onion very finely and leave it to soak for an hour in water. 5. 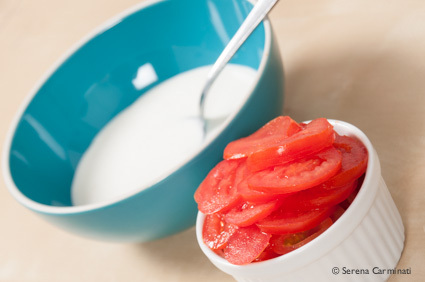 Wash, dry and cut the tomatoes into small cubes. 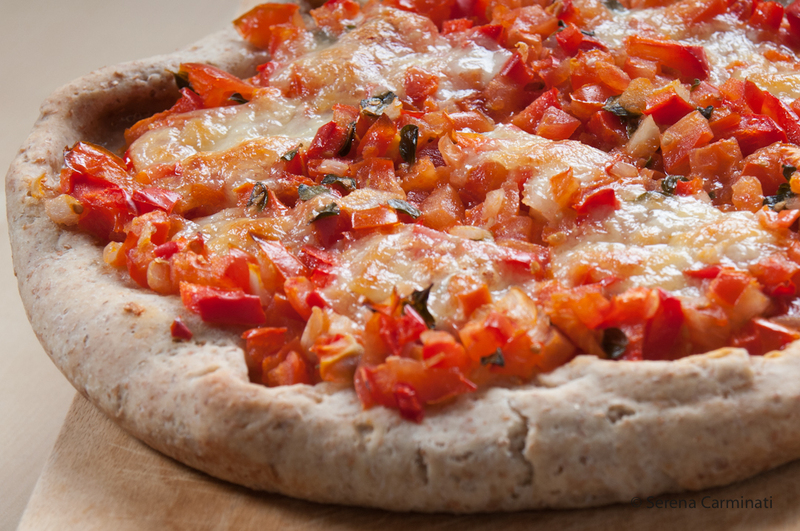 Top your pizza base with the onion and the tomatoes. Season your pizza with plenty of extra virgin olive oil and bake at 200 ° C (392° F) for 30 minutes (until crispy). Remove from the oven, season with salt and pepper, and garnish with a few rocket leaves. To shorten the preparation time, I usually make a lot of dough, I divide it into small quantities and store it in the freezer. In this way the dough is ready when I need it. Leave the seeds to soak at night, this also save some time. Ingredienti per la base della pizza ai cereali. 1. Lavate e lasciate i semi a bagno in acqua per 6-8 ore. Nel frattempo, unite le farine e il malto al lievito madre, aggiungendo un po’ d’acqua, se necessario. Lavorate bene l’impasto. Aggiungete i semi, con mezzo cucchiaino di sale e aumentate la quantità di farina nel caso il composto risultasse troppo umido. 2. Fate lievitare fino a quando l’impasto sarà raddoppiato di volume (3-6 ore). Se usate il lievito di birra dovete aggiungere 45 g di farina 00 all’impasto, poi diluire il lievito di birra in un po’ d’acqua e impastare tutto. In questo caso, dovete lasciare lievitare per un’ ora circa. 3. Quando l’impasto sarà lievitato, stendetelo su una teglia rotonda (25-30 cm di diametro), ungendo la base con abbondante alio d’oliva. Lasciate lievitare per 1 oretta. Nel frattempo, tagliate la cipolla e lasciatela immersa in acqua per almeno 1 ora (per renderla più dolce). Lavate, asciugate e tagliate i pomodori a cubetti. 4. Disponete la cipolla e i pomodori sulla pizza e condite con abbondante olio d’oliva .Cuocete a 200 ° C per 30 minuti. Sfornate, condite con sale e pepe, aggiungendo qualche foglia di rucola per guarnire. Per accorciare i tempi, generalmente preparo in anticipo una grossa quantità di pasta, la divido nelle giuste dosi e la scongelo in caso di bisogno. Questo procedimento facilità notevolmente le cose e funziona alla grande! Consiglio anche di lasciare i semi immersi nell’acqua tutta la notte, saranno più morbidi e i tempi di preparazione saranno più facili da gestire. Posh and perfect! 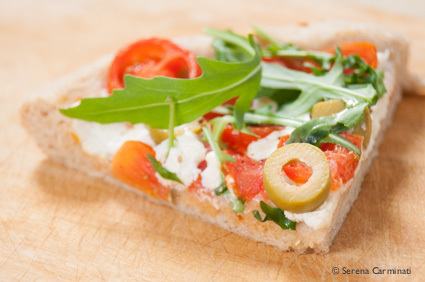 Wholemeal pizza with goat’s cheese, olives and rocket (arugula). This is a great veggy pizza! The dough, once cooked, is perfectly crunchy on the outside and soft on the inside. I used a mixture of manitoba, semolina and wholemeal flour to give elasticity, crispness and flavour to the pizza. Instead of using sourdough you can use 6 g of yeast to significantly reduce the rising time of the dough. At this link https://foodfulife.wordpress.com/2013/01/02/how-to-make-natural-yeast-sourdough/ you will find a short article that explains how to make sourdough at home. Wholemeal pizza with goat’s cheese, olives and rocket (arugula). 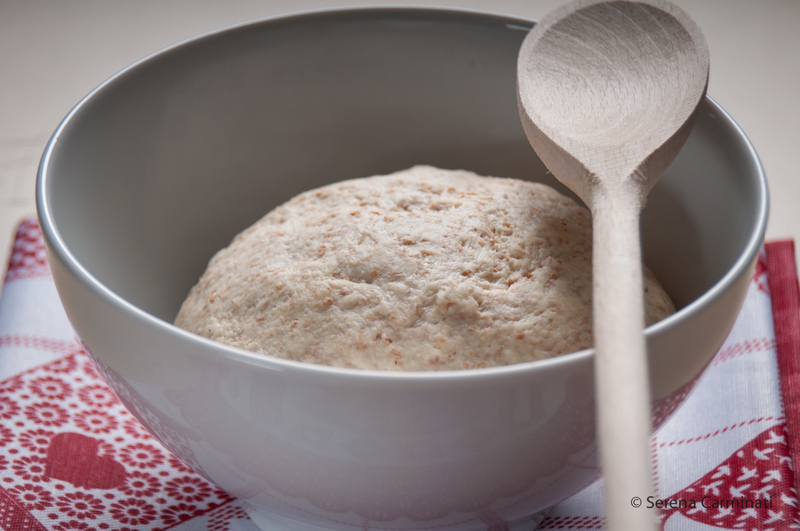 Create a starter dough with 50 g (1.76 oz ) wholemeal flour, 50 g manitoda flour and 50 g sourdough. Knead the starter dough with 100 ml (3.38 fl. oz) water and half a teaspoon of honey. Cover and set for a couple of hours. After 2 hours, take the starter dough and mix with the semolina flour ( adding some water or flour if needed). Add a teaspoon of salt and a tablespoon of oil and work until smooth. Let rise for a few hours, and then the dough will ready when it doubles in volume. Roll out the dough and place in a baking tray, previously evenly greased with a tablespoon of olive oil. Cut the tomatoes and the olives into thin slices. 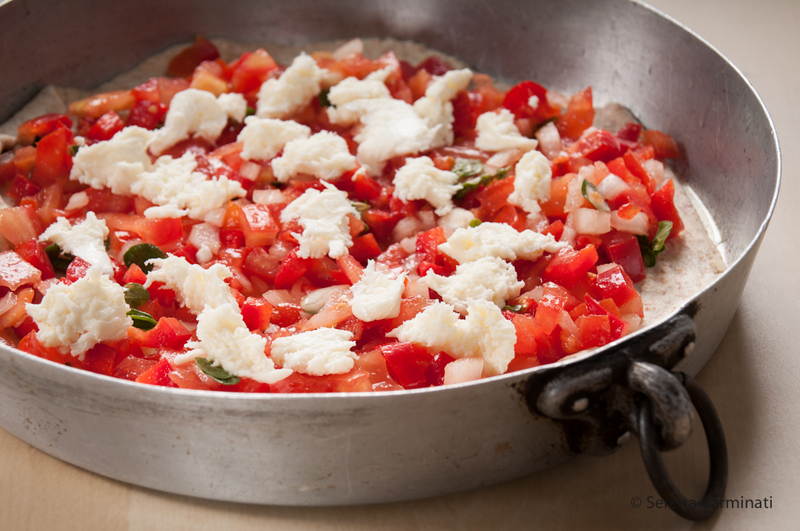 In a small bowl, mix the goat’s cheese with crescenza until smooth. 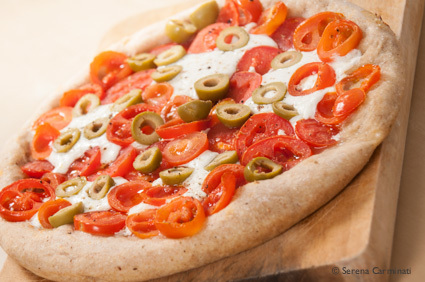 Alternating, place the tomatoes and cheese on top of the dough, then garnish with some slices of olives. Season your pizza with a tablespoon of olive oil, some salt and pepper. Bake at 200 ° C (392° F) for 25-30 minutes. Top the pizza with fresh rocket and serve. Pizza integrale con formaggio di capra, olive e rucola. Create un lievitino con 50g di farina integrale, 50g di farina manitoda e 50 g di lievito madre. Impastate il lievitino con 100 ml di acqua e mezzo cucchiaino di miele. Coprite e lasciate lievitare per un paio d’ore. Dopo la prima lievitazione, prendete il lievitino e impastate con la semola (aggiungendo un po’ d’acqua o di farina se necessario). Aggiungete un cucchiaino di sale e un cucchiaio d’olio all’impasto. Lasciate lievitare per qualche ora ( tenete presente che l’impasto è pronto quando raddoppia di volume). Stendete l’impasto su una teglia, uniformemente unta con un cucchiaio di olio extravergine d’oliva. Tagliate i pomodorini e le olive a fettine. In una terrina piccola, unite e mescolate bene la crescenza con il formaggio di capra, fino ad ottenere una crema abbastanza omogenea. Cospargete i pomodorini alternandoli al formaggio sulla base della pizza e finite di decorare con delle fettine di olive. Condite la pizza con un cucchiaio di olio, un po’ di sale e pepe. Fate cuocere a 200° di per 25-30 minuti. Sfornate la pizza, aggiungete la rucola e servite. More than just another pizza! A pizza for all occasions. A great dish, full of flavor but also healthy as it contains whole grain fibers and vitamins. Personally, I prefer the flavor and texture of different flours mixed together, compared to plain white flour, I think it’s a matter of habit. With experience, I realized that by gradually increasing the use of whole grains and vegetables in the preparation of traditional dishes you can have a healthier diet without having to give up taste or tradition. Pizza with three flours and vegetables. 100 g of sourdough (3.5 oz) or 5 g yeast dissolved in a little water. 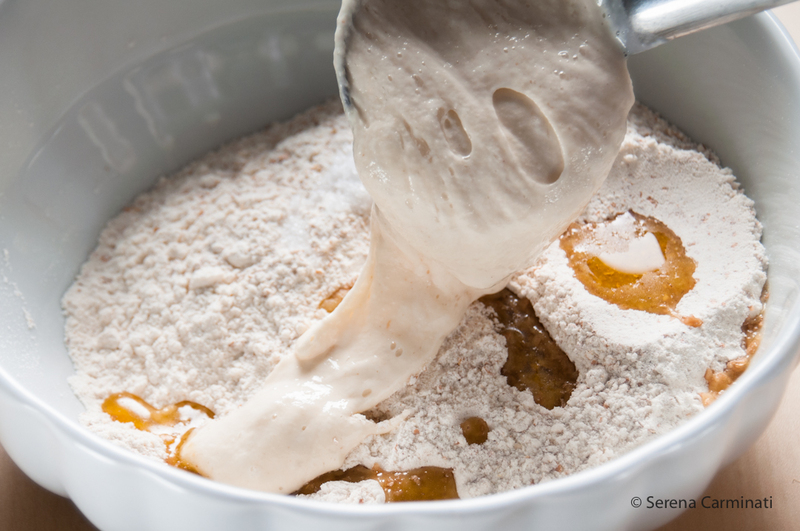 Prepare the dough by combining the three flours, salt, olive oil and sourdough (or yeast). Mix all the ingredients together and knead to form a soft and smooth dough ( add some flour if the dough is too wet and a little more water if is too dry). Let the dough rise in a bowl with a wet cloth on top for 6 hours if you use sourdough or for an hour if you use yeast. Cut the vegetables, place them in a bowl and drizzle with some olive oil, a pinch of salt and some marjoram. When the dough is ready roll it out with a rolling pin, pour a little oil evenly over the bottom of a round baking tray and roll out the dough until the baking tray is completely covered. Place the vegetables on top of the dough and add some mozzarella cheese. Bake for 20-30 minutes at 180 ° C (356°). Sprinkle the pizza with some ground pepper and serve it hot. Una pizza ideale per tutte le occasioni. Un ottimo piatto unico, ricco di sapore ma anche sano, perché contiene fibre e vitamine. Ho elaborato questa ricetta perché personalmente preferisco il sapore e la consistenza delle farine miste, rispetto alla farina bianca, credo sia una questione di abitudine. Con l’esperienza, ho capito che incrementando gradualmente l’uso di farine integrali e verdure nella preparazione di alcuni piatti tipici si può avere una dieta più varia e sana, senza dover necessariamente rinunciare a gusto o tradizione. Pizza alle tre farine con peperoni e maggiorana. 100 g di lievito madre o 5 g di lievito di birra sciolto in un po’ d’acqua. Preparate l’impasto unendo le tre farine, il sale, l’olio e il lievito. Mescolate tutti gli ingredienti, impastate fino a formare una pasta morbida e omogenea, aggiungendo un po’ di farina se l’impasto è troppo umido e un po’ più d’acqua se il risultato è troppo asciutto. Lasciate lievitare l’impasto in una terrina con sopra uno straccio umido per sei ore se avete usato il lievito madre o per un’ ora se avete usato il lievito di birra. Tagliate le verdure, riponetele in una scodella e conditele con un filo d’olio, un pizzico di sale e la maggiorana. Quando l’impasto sarà ben lievitato stendetelo con un mattarello, versate un po’ d’olio uniformemente sul fondo di una teglia rotonda e stendetevi l’impasto fino a coprirlo completamente. Versate le verdure sopra l’impasto e aggiungete la mozzarella. Infornate a forno caldo per 20-30 minuti a 180°. Spolverate la pizza con del pepe macinato e servitela calda.